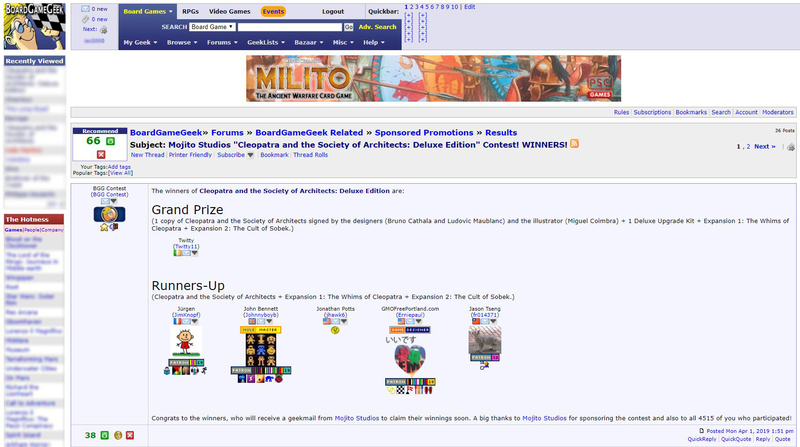 Here you are the Bgg Contest winners! Thank you all for participating! 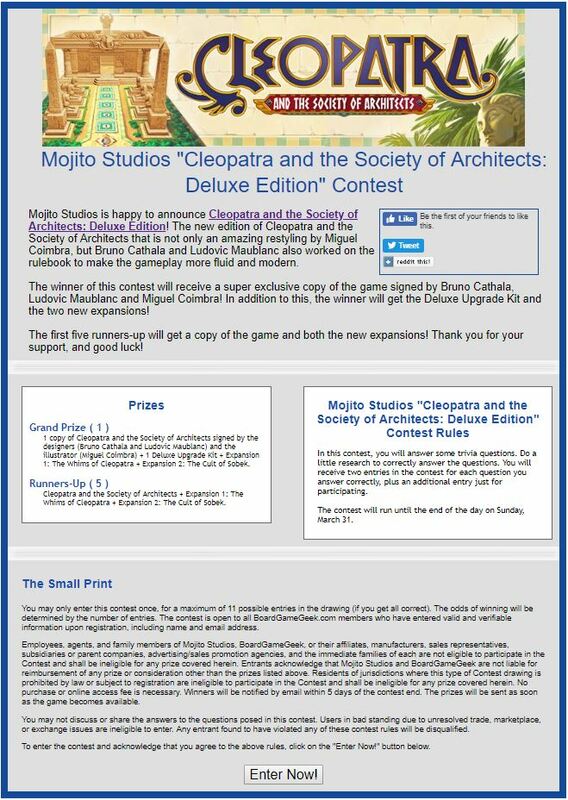 Join our competition and win Cleopatra and the Society of Architects Deluxe Edition. 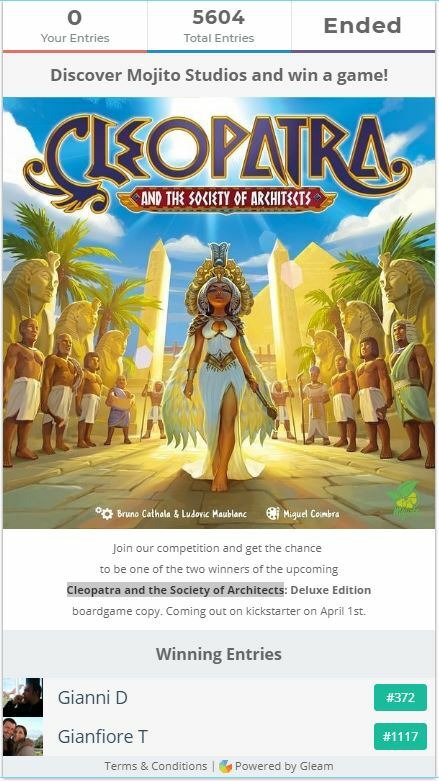 1 copy of Cleopatra and the Society of Architects signed by the designers (Bruno Cathala and Ludovic Maublanc) and the illustrator (Miguel Coimbra) + 1 Deluxe Upgrade Kit + Expansion 1: The Whims of Cleopatra + Expansion 2: The Cult of Sobek. 5 copy of Cleopatra and the Society of Architects + Expansion 1: The Whims of Cleopatra + Expansion 2: The Cult of Sobek. Are you ready for another episode about new rules? Today we will talk to you about the worshippers of Sobek. 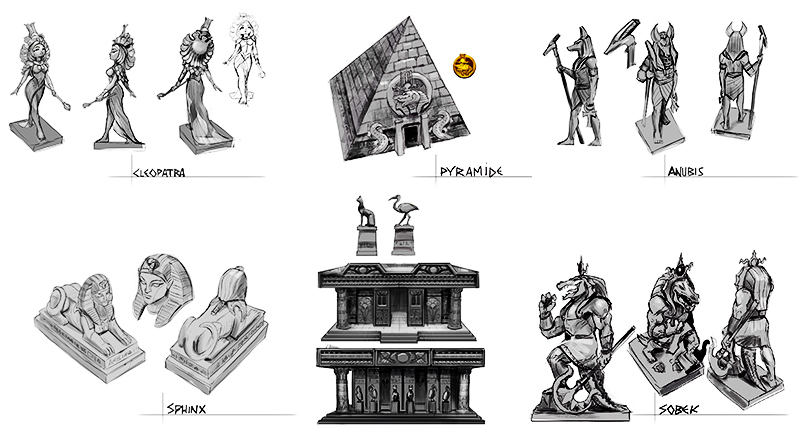 The worshippers of Sobek are corrupted characters that may offer their services to you throughout the game. 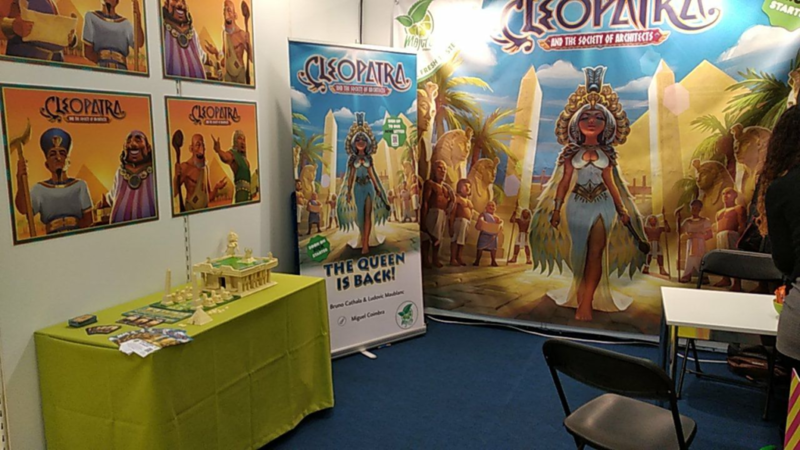 In the previous version, the worshippers of Sobek were represented by cards shuffled into the main deck and you could get them when visiting to the Market. THE BEGGAR – Draw 4 cards from the main deck. THE MERCHANT – In this turn, you can build with 2 less resources. THE ARCHITECT – In this turn, earn 4 Talents for each building built. THE FOREMAN – In this turn, you can build with 2 less Artisans. THE VISIR – In this turn, you can visit the Market AND the Quarry. At any time during your turn, you can ask for worshippers of Sobek’s help. They are very powerful but the price to pay is very high. So be careful not to abuse them too much! 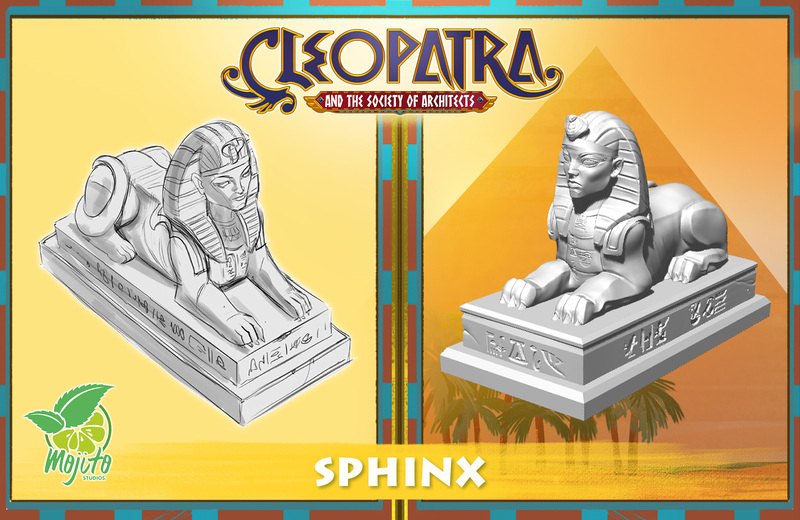 CLEOPATRA AND THE SOCIETY OF ARCHITECTS: THE BOX! Don’t judge a game by its cover… or maybe do! 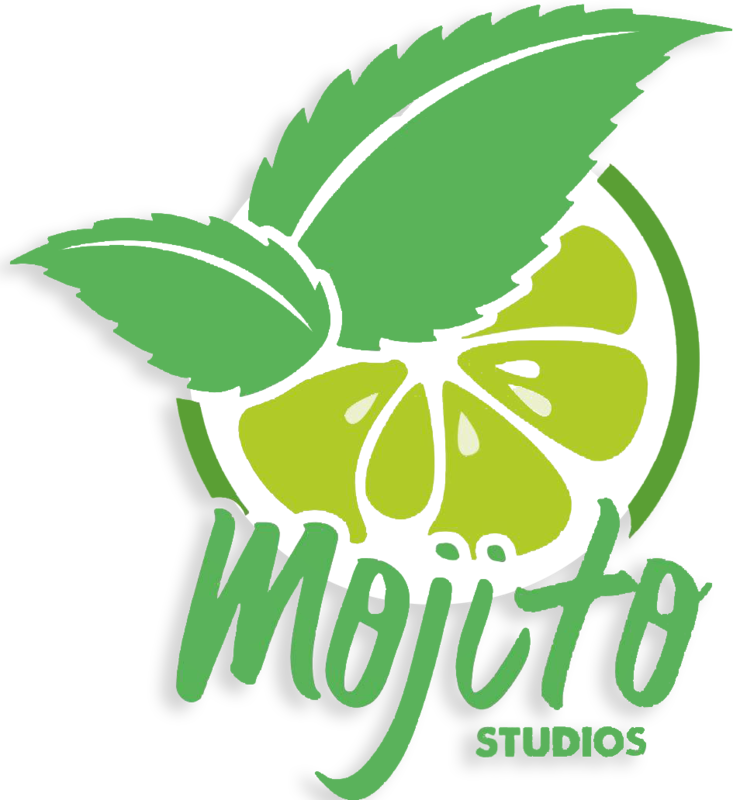 “Even if we are proud of the initial version of the game, we both are convicted that game experience has to be improved, and that some game elements into the original game are not sufficient. I have only one guideline when designing games: work on the game i want to play myself. So we conducted the changes in that direction: build the game we want to play for ourself, now”. We are enthusiastic about the work done by the authors and we believe that the updates make the game even more fun and engaging. The first one concerns the Offering to the Great Priest. During the game, by means of a secret bet, you have the chance to get rid of some Corruption Amulet by offering Talents to the Great Priest (you must be very generous, otherwise the risk is to receive further Corruption Amulets!). In the previous version, this phase depended on the result of the 5 Dice of The Great Priest. 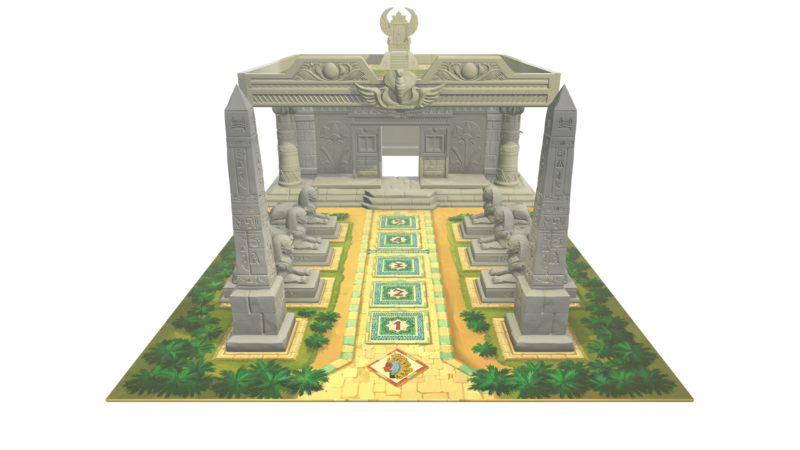 In the new version the Offering to the Great Priest is made only once during the game, at a specific time: when Cleopatra moves from the 3rd to the 4th space of the walk. So many of you joined our contest, but the winners are only two. Congrats to Gianni D. and Gianfiore T.! Come and admire Cleopatra’s Palace, the wonder built by the architects to honor the greatness of the timeless Queen of ancient Egypt. The Queen is revealed. Everyone was able to admire her and the Palace built in her honor. With Mojito, the Queen arrives in Nuremberg! 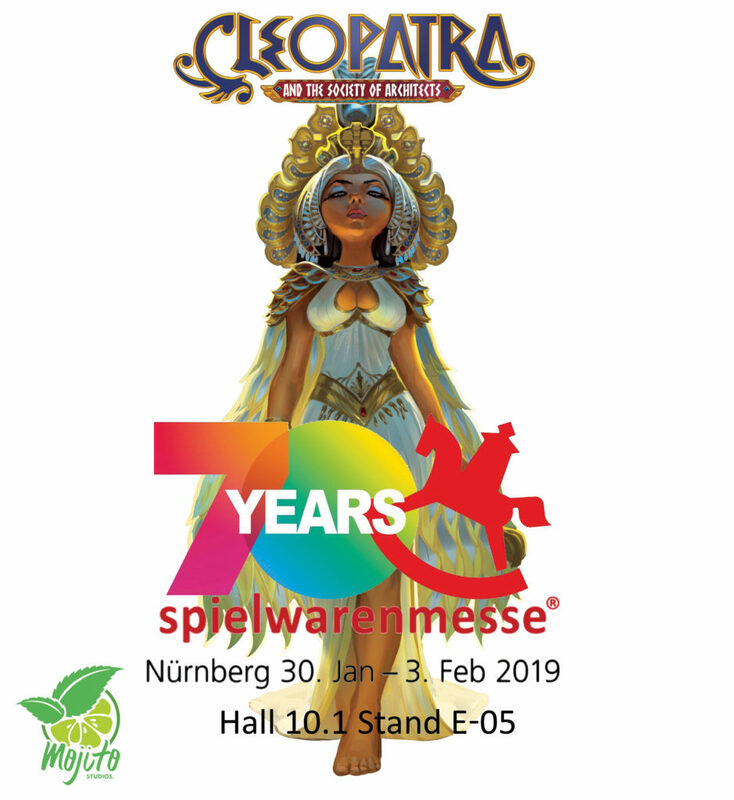 With Mojito, the Queen arrives in Nuremberg! If you want to admire her, you’ll find her at the Hall 10.1 Stand E-05! 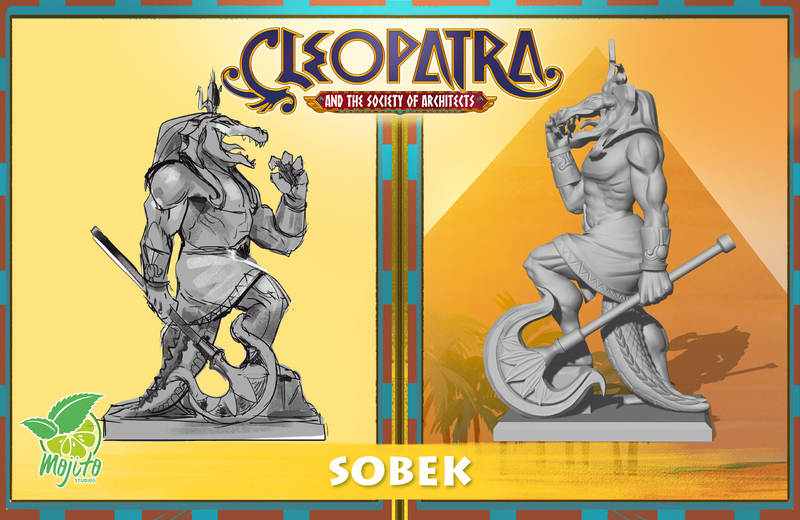 Sobek, the great and revered god with the head of a crocodile, protector of the waters and fertility, will use his power to defend you from the crocodile’s jaws. But you must prove to deserve his benevolence and build an immense statue in his honor! 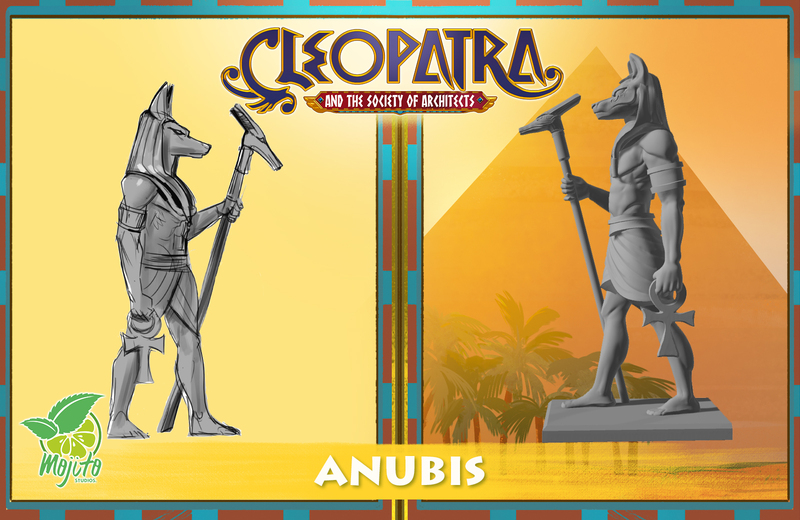 If you build a Sanctuary inside the Palace’s Gardens, Anubis, the god worshiped by the ancient Egyptians, will take upon himself the weight of your corruption. So maybe you will avoid a horrible end in the belly of the crocodile! 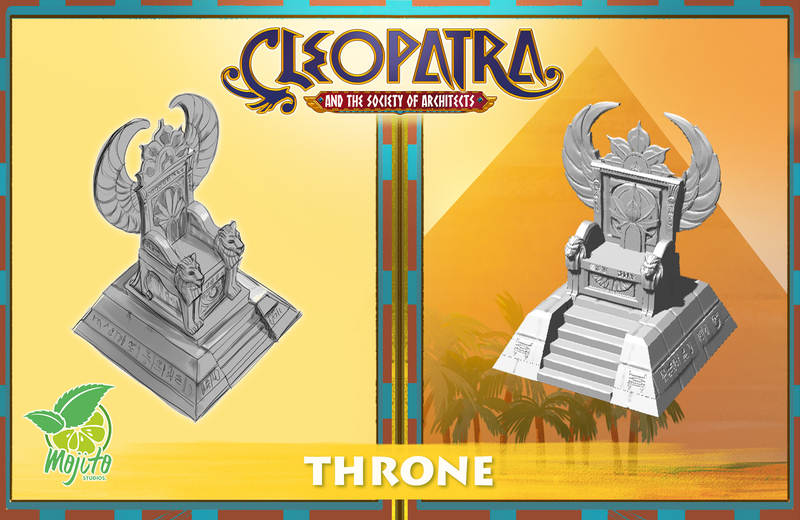 And here Cleopatra, the great Queen of Egypt, comes! With a sure and elegant step, she heads towards the Palace that the Architects have created for her. 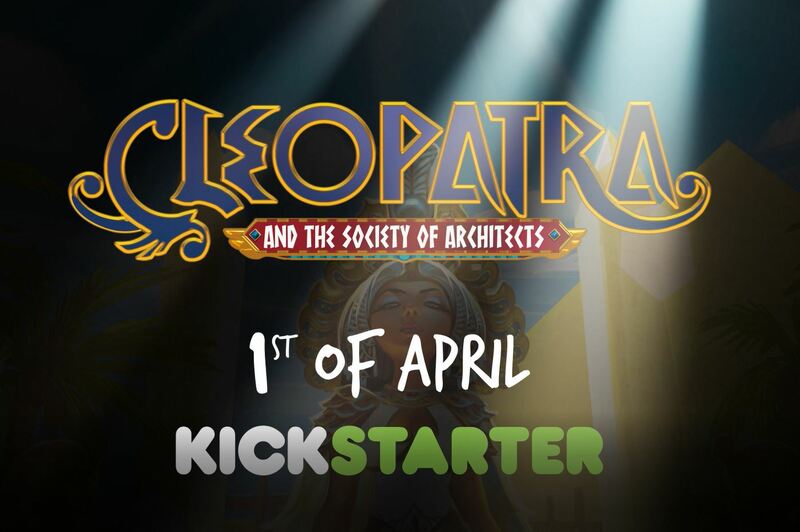 Cleopatra and the Society of Architects: Deluxe Edition on Kickstarter on April 1st. When the Palace will be finally finished, the Queen will sit on her throne admiring the great wonder that has been built for her! Two obelisks will rise at the entrance of the Palace and on them will be carved the story of Queen Cleopatra, sovereign of Ancient Egypt. So she will be immortal and her name, handed down to posterity, will survive the passage of time. 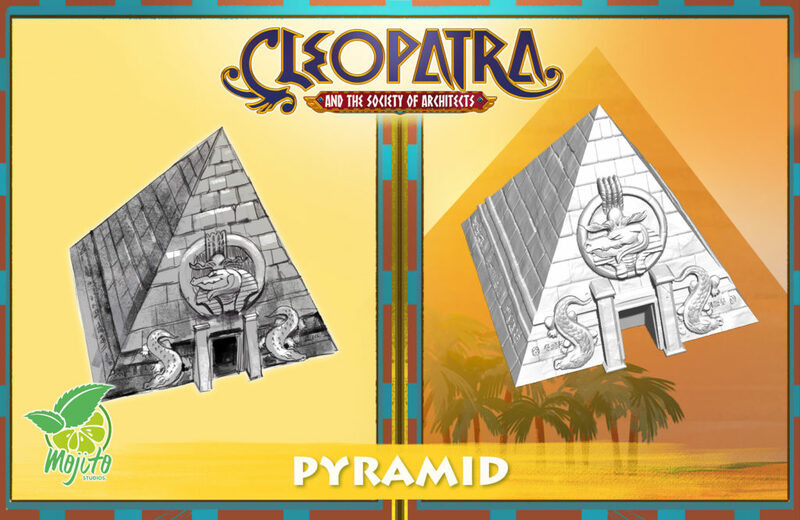 The pyramid, symbol of ancient Egypt, will serve you to keep your Amulets of Corruption … not too many if you don’t want to end in the belly of Cleopatra’s favorite pet… THE CROCODILE! 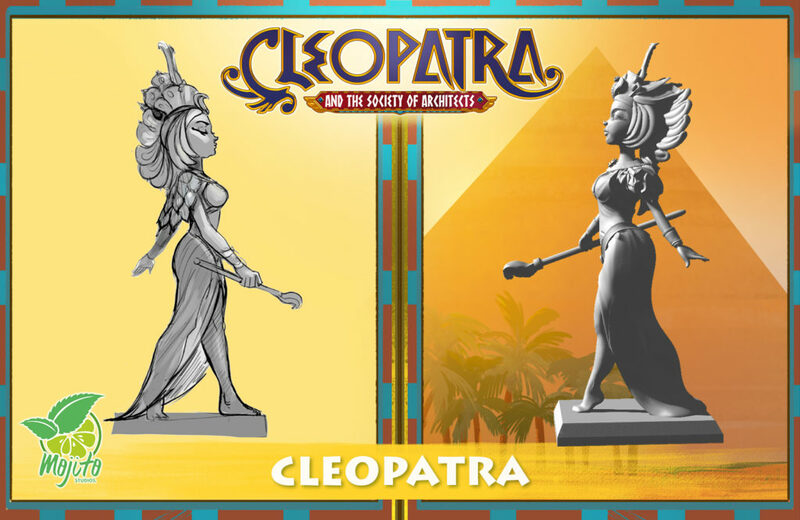 Cleopatra and the Society of Architects is coming to Kickstarter!